Fresh air hitting your face. Beautiful views. Wildlife sightings. If you’ve never been an airboat tour, it’s a once-in-a-lifetime experience you won’t ever forget. 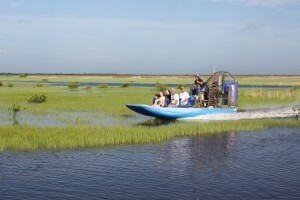 Airboat tours are fun and give you an amazing view of the Everglades. For this article, we wanted to share with you some reasons you should go on an airboat tour the next time you’re in Florida or in the Everglades. Any age can enjoy these rides. You’ll learn a lot about wildlife, plant life, and the Everglades from the airboat captain. The airboat is safely equipped in case of any emergency. Life jackets and ear protection are provided. Airboats are properly maintained and inspected throughout the year, so they are working properly. You get the chance to possibly see alligators, birds, turtles, fish, and other wild life. You’ll get to go fast on the water. There’s never a bad time to go on an airboat ride. The weather is always comfortable! You will have breathtaking views of the Everglades. You get views of the Everglades you can’t get anywhere else. You get a private tour. Airboats can go in places big boats cannot go. You can enjoy this experience with family and friends. You will see different things each time you go out on an airboat. Captain Mitch has been involved in airboat tours for more than 30 years in the Everglades. Captain Mitch and his team are filled with so much knowledge of the area – you will learn so much while having fun exploring the Everglades’ ecosystem. Whether this is your first time on an airboat or your 50th time, we know you’ll have a memorable experience. Florida resident? Tourist? Doesn’t matter! Airboats are fun for everyone! Come check out this magical national park.To book an airboat tour, call Captain Mitch’s Airboat Tours at 800-368-0065 or click our Private Everglades Airboat Tours page.